We provide services for transmission and distribution system operators. We have many years of experience in providing support services for high and medium voltage network operating crews. We offer one of the annual periodic visual inspection of the power line from the air i.e. 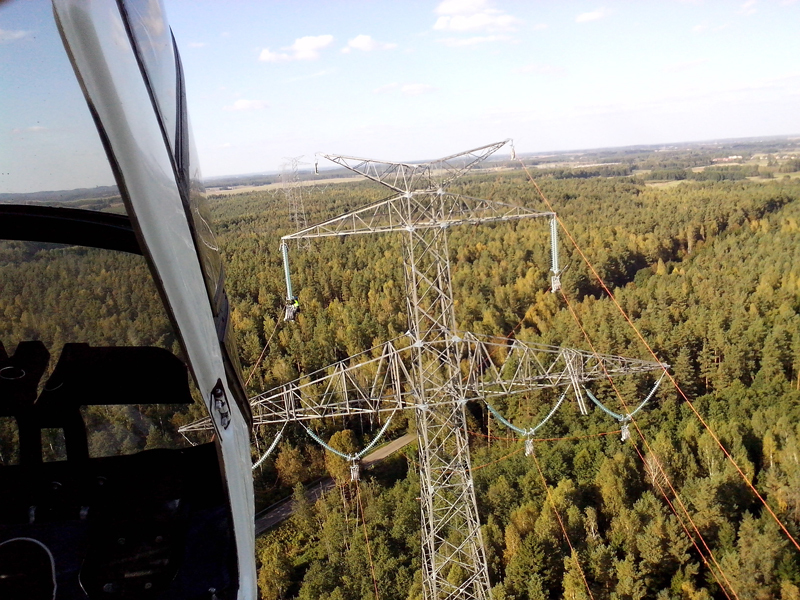 from helicopter flying with an average speed of 40-50 km/h by qualified observer which records remarks on specially designed aerial work inspection cards or record route of power line by airborne B-cam Information about damage of the power line demanding immediate intervention is transferred to or from the helicopter during the flight or after the flight. We carry out a visual inspection of the line from the helicopter flying at average speed (to the segment of line) 180 km / h and the average working speed 40 – 50 km / h over the inspected by observer segment with the recording of the cause of the failure on the video tape through the B-cam camera installed on helicopter. Inspections are carry out as the unit reports such needs, without the previously prepared schedule. The observer determines precisely the cause and location of the failure and suggests a way to removing the cause of the failure, B-cam tape is an additional documentation of the location and type of failure. 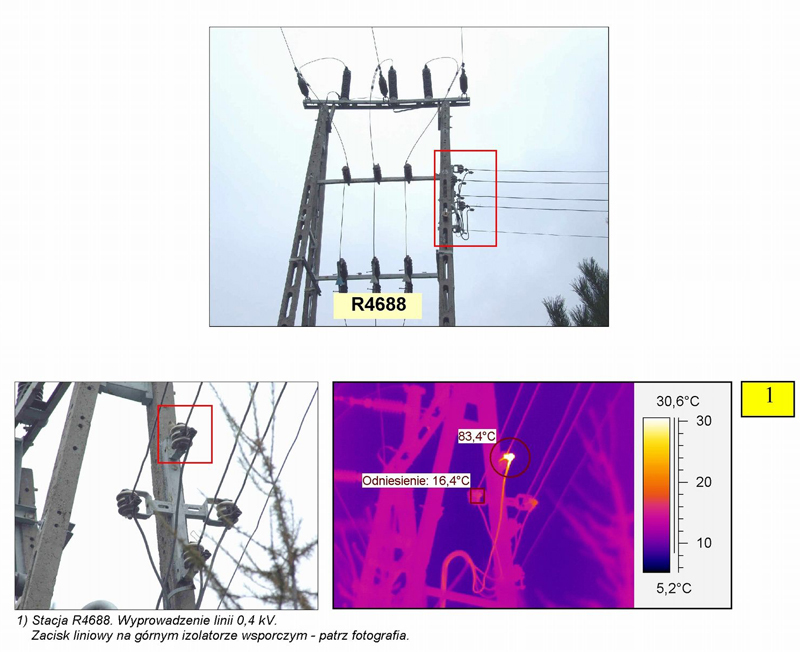 Thermography (thermal mapping surface of the object under study) is a modern technique for identifying locations of overheating of electrical components during work. The helicopter is equipped with a thermal imaging system. It is the latest generation device for long-range observation with the ability to overlay the GPS coordinates, gimbal position. The apparatus includes a specialized computer system that allows on-screen view of the results and allows to digitally record the image on a magnetic medium. The media capabilities allow to save single images every 1/5 seconds for 2 hours. Geographically coordinates are assigned to each image, which guarantees a fast and error-free correct location of recorded material. The thermovision measurement allows control of the current connections of the extractors on the power transmission poles and inter-span joints. The assessment of the connection status is made by comparing the measured temperature increments of the connected cable with reference values (depending on: air temperature, surface emissivity, cable cross-section, current load) relative to the permissible long-term load. With this method it is possible to locate places with a temperature difference of up to 0.1 ° C. In order to ensure profitability of the operation, the line control is carried out at a load of at least 50% of the rated current of the line. diagnostics during full-load of line and increasing safety of work. Used so far the analog device record the phenomenon on the route of the line. This year a new type of camera recording the phenomenon was presented. The list above does not include all the opportunities offered by helicopters for this industry, so we invite you to contact AIRCOM and we encourage you to cooperate in order optimization services.